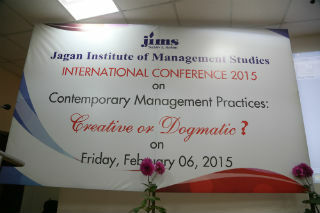 Jagan Institute of Management Studies organised an International Conference on “Contemporary Business Practices:Creative or Dogmatic?” on 6th February 2015. 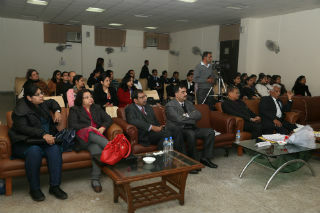 The guests of honour were Prof. Neena Sinha, Prof, USMS, Guru Gobind Singh Indraprastha University and Prof. DPS Verma, Prof. (Retd. ), Delhi University. 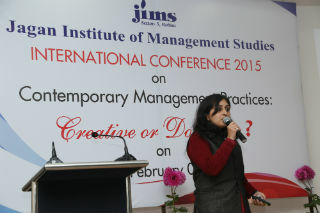 Welcome address was delivered by Dr. J.K.Goyal, Director, JIMS and the Conference introduction was given by Ms. Yukti Ahuja Sharma, Faculty, JIMS. 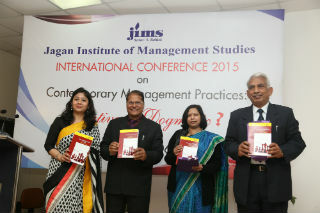 The proceedings of the conference were released in the form of a book. Research scholars, management professionals, as well as renowned and experienced professors/faculty were provided a platform in this conference to present their research papers and bring to light their innovative ideas. 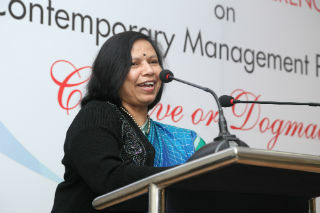 Policy implications were highlighted at the end of each presentation giving different and new insights to the concept of leadership, management and competition in the corporate world. 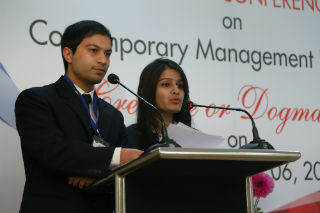 The conference received contributions from PAN India and abstracts from abroad as well. The abstracts and full papers were rigorously reviewed by the reviewing panel and the most appropriate papers were shortlisted for full paper or abstract publication. Paper presenters came from different parts of the country and shared their research work. 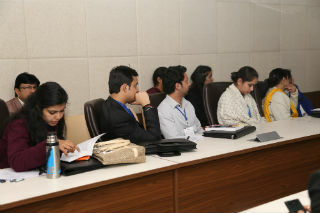 The technical sessions were conducted in 2 Tracks with more than 10 presentations in each track. Each presentation was followed by a Question Answer Round and a thorough discussion on the research area. The technical sessions were followed by reviews from esteemed panelists in the valedictory session wherein certificates were handed over to all the participants. Best Paper Award (Amount of Rs.7500) and second best paper (Amount of Rs.2500) award were announced for each track. 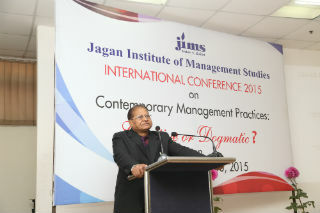 Vote of Thanks was given by Dr. Sumesh Raizada,Dean (PGDM), JIMS. Overall, the Conference was a great learning experience for the participants as well as for the audience and received an overwhelming response and appreciation.